How about the rest of Minnesota? 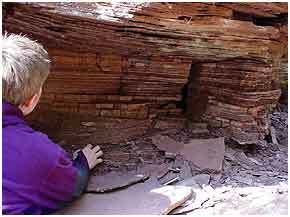 Visit the Minnesota DNR Geology page for a more detailed version of Minnesota's Geologic History. The geology of the North Shore of Lake Superior tells the story of an aborted attempt by the North American continent (Laurentia) to break apart about 1.1 billion years ago. Continental rifting is a common and recurring process in the history of the earth that leads to break-up of continents and the formation of ocean basins. A geologically recent example is the ongoing expansion of the Atlantic Ocean that began with the breakup of the supercontinent Pangea about 200 million years ago. The Midcontinent Rift began to form 1109 million years ago along a 2000-km-long arcuate break that extended in two arms from the Lake Superior region - one to the SW to Kansas; the other to the SE to Lower Michigan. As the crust broke and thinned, basaltic magma generated 50 to 100 kilometers deep in the earth rose to the surface. Most of this magma erupted layer upon layer of lava flow into an ever widening and deepening rift valley. We now see some of these lavas as the North Shore Volcanic Group. Sometimes the magma ponded and slowly solidfied in chambers within the lava pile to form coarse-grained igneous intrusions, some of which we now see as the Duluth Complex. After almost complete separation of the originally 40-km-thick continental (granitic) crust and its replacement by ocean (basaltic) crust, magmatic activity and rifting abruptly ceased about 1086 million years ago for reasons not completely understood. The cooling of dense lava rocks caused continued downwarping of the rift valley and led to its infilling with sediments. We now see these sediments as the sandstones of east-central Minnesota and northwestern Wisconsin (Bayfield Peninsula). Buried beneath a blanket of sand, the Midcontinent Rift became a scar on the face of Laurentia. Its role in shaping the landscape of Minnesota was not done, however. The creation of the Lake Superior basin and the ruggedness of its shoreline reflects the erosive power of continental glaciers that advanced and retreated over Minnesota several times in the past 2 million years. However, the exact shape of Lake Superior can be directly correlated with the geology of the Midcontinent Rift and the relative erodability of the lavas, intrusions and sandstones contained within it. The awesome erosive power of mile-thick ice sheets found it easy to erode loosely cemented sandstone that filled the axis of the rift valley, but encountered more resistance from the crystalline igneous rocks forming the flanks of the rift - now the margins of the lake basin. In the final retreat of the ice from the Lake Superior basin about 11,000 years ago, meltwaters filled the scoured-out sandy core of the rift. As the last glacier retreated west to east across the basin, meltwaters at times filled the lake to as high as 500 feet above the current level; at other times, water drained from the lake to levels about 250 feet below the present 600' elevation. Elsewhere in the state, the older bedrock geology did not exert such a strong control on the glacial landscape. The Duluth area displays all elements of these geological events. The lava flows that erupted into the Midcontinent rift are exposed along the shore northeastward from downtown. The deeply-formed igneous intrusions of the Duluth Complex are exposed along the rocky escarpment between Bardon Peak and Radio Tower Hill. The sandstone that buried the igneous rocks of the rift are exposed near Fond du Lac in the stream bed of Mission Creek. The glacial history is recorded in the blanket of sediment that covers much of the old bedrock throughout the Duluth area. Even the higher glacial levels of Lake Superior are evident in the beach sand deposits and and eroded notches found along the escarpment. In fact, Skyline Parkway roughly follows one of the highest stands of the lake called the Glacial Lake Duluth level. In a very real sense, the Duluth area and most of northeastern Minnesota can be said to have been born of fire and ice. Visit our page in the Community section on the geology of Duluth for more details and pictures.